After extensively using a Spektrum DX6i RC radio now for over 9 months, I thought it was time to write a review on it; especially since I consider it to be the best entry level computerized RC radio on the market right now. The new "talking" DX6 with telemetry takes the great DX6i one step further. 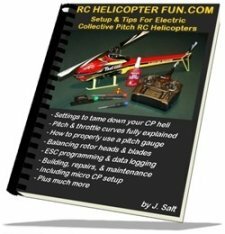 As I have stated more than once (almost to the point of ad nauseam) - if you are getting into single rotor RC helicopters with collective pitch, especially if they have eCCPM swash mixing, a computerized radio is more necessity than need. Computerized radios allow you to properly setup and level your CCPM swash - a very necessary task. 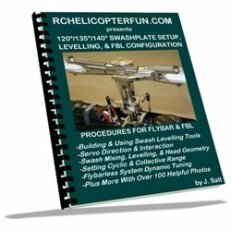 Being able to tame down your throttle and pitch curves, dual rates, exponential rates, and of course ATV (adjustable travel volume) values of all channels is so important to single rotor collective pitch heli success. Not to mention programming gyro output ATV values for remote gyro gain – pretty much the only gyro option these days even with basic inexpensive RC helicopter gyros or flybarless systems. 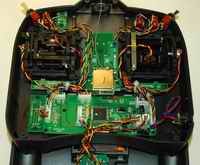 Simple micro coaxial RC helicopters can also benefit from the increased versatility of a computerized radio, this holds especially true for programming throttle curves to give ultra smooth throttle response and lift control. Small park flier fixed wing aircraft benefit as well with functions such as aileron/flap mixing or any configuration of tail mixing for all tail/wing types. The Spektrum DX6i allows all these important functions and more. Add to these necessary programming features a large enough LCD display to actually be able to see what you are programming and is capable of showing graphical representations of pitch and throttle curves in a RC radio that is around 200 beans, and you have all the ingredients that make up a Spektrum DX6i. This review of mine is not going to talk about specs – you can get those anywhere (here's a link to the DX6i spec page on Spektrum’s web site if you are spec hungry). Along with the new voice alert DX6 version. What I want to share is the hands on experiences I have had with this radio and give you both thumbs up and thumbs down on DX6i usage and ownership. This is a RC helicopter specific web site of course and the experiences I have had with the Spektrum DX6i are primarily with RC helicopters; from simple micro electric coaxial up to 40 size single rotor nitro. That said - fixed wing pilots will also get some “touchy feely” tidbits of Spektrum DX6i operation out of this write up as well. 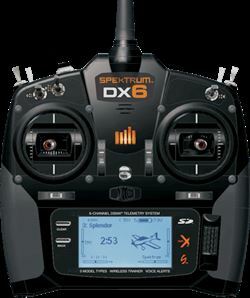 The Spektrum DX6i is just as capable and has as many fixed wing specific program menus in acro mode as it does in heli mode. Obviously the main reason I even have a Spektrum DX6i radio is because it is computerized. This means “ADAPTABILITY”. Planes and helis of all configuration types can be flown with the ability to program and fine tune many functions to give you precise control customized to your RC model, your skill, ability, and comfort levels. With 10 different model memory locations, you will have a powerful tool that will grow with you as you expand and diversify with different RC helicopters, airplanes, or both. The DX6 has an impressive 250 model memory along with SD card support so its got endless growth in the number of model department. There are many computerized radios on the market and I have used a number of them but none are as intuitive to program and understand the menu layout as the Spektrum DX6i and even more so the DX6. The one touch scroll/enter button is the main reason for this. No more multiple buttons to press or awkward button combinations to remember in order to access certain menus or screens. Just click on the dial and scroll to the field you wish to program. One thumb operation, logical menu layout, and no BS – pretty much the best system going in my books. DSMX is Spektrum’s latest patented spread spectrum modulation systems that all but eliminate frequency conflicts and interference issues found with the older 72 & 75 mega hertz bandwidth and even in very crowded RC event environments with perhaps up to a hundred transmitters all turned on. DSMX builds on Spektrum's DSM2 technology making it even more immune to interference conflicts and the best part is it's completely backward and forward compatible with older DSM2 receivers. DSM2 & DSMX gives a peace of mind radio link with your model, but also provides something called "Model Match". This simply means it is impossible to fly your plane or heli unless you have the correct model selected from one of the 10 memory locations. What this means for you and me is no more crashing due to forgetting to change to the correct model in the memory (yes this is a very common problem). If you only have one RC model, that is not going to be an issue, but once you have several – model match is such an important benefit. Those are the main technical benefits of DSM2 & DSMX; but in my opinion after being involved with this hobby for years, BNF is one of the best ideas to add even more value to DSM2/X modulation. Bind n’ Fly is a marketing stroke of genius that is not only good for Horizon Hobby, but also good for the RC consumer. Dare I say it, a win-win solution for everyone? You see, in the past any time you wanted to get a new airplane or helicopter, you had to get the model, get the on-board electronics (servos, receiver, etc). You may have even needed to get a new radio. This was not only expensive, but a hassle and it seemed wasteful – at least to me. Now with BNF any model that comes all ready to go with Spektrum or JR DSM2 or DSMX modulation can be bound to any good DSM2/X radio like the Spektrum DX6i. This feature more than any other is why I converted all my aircraft over from Futaba to Spektrum/JR. I was a die hard Futaba guy for over 20 years so this is a big step for this old dog; but the brilliant logic with a true “one system for all” can’t be ignored any longer – at least if I really want to save some money & time in this hobby. The additional benefit of using one radio for everything and feeling 100% comfortable with it, the switch layout, and programming fields is easy to appreciate. I know Futaba’s FASST system is capable of this as well (not model match however); the problem is Spektrum/JR beat them to the punch with this great idea and I have since purchased some great little Bind n’ Fly helicopters and airplanes that all came ready to go with a DSM2/X receiver saving me the cost of purchasing a receiver, servos, or even another radio, not to mention the time saved. I now have a DX8 & JR X9503 as well knowing I have all these DSM2/X equipped models plus others with JR and Spektrum DSM2/X receivers as well as flybarless systems that work seemlessly with spektrum/JR satellite receivers – now you can appreciate the marketing genius in this. 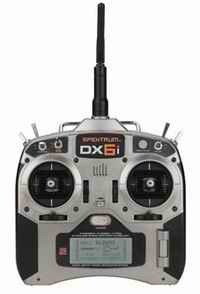 Unlike most RC radios (even cheap non computerized toy like ones that run on a nominal voltage of 9.6 volts and use eight AA batteries) the Spektrum DX6i only requires 4 AA batteries to operate - the DX6 allows for a lithium pack upgrade as well. This will save you money in battery replacement over the years or if you get rechargeable AA batteries for the DX6i or the lithium pack for the DX6 (which I highly recommend). The DX6's throttle/collective stick movement is butter smooth – better than most other entry level RC radios in this price segment (at least without modification). 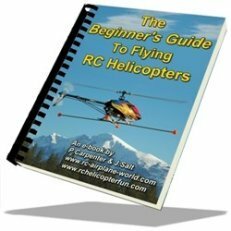 On a heli specific radio you don’t want throttle stick indexing of course and no RC heli specific radio will have harsh indexing, but will usually have a bit. 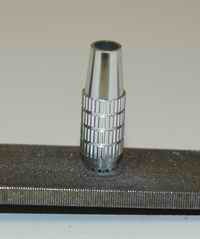 The DX6i has none, just a perfect amount of smooth resistance. This is very beneficial to a fixed wing pilot as well for the precise throttle control needed for “hangin’ on the prop”. To tell you the truth, in this day and age, I don’t see any value to indexing the throttle stick for any type of flying; just my opinion of course. The DX6i supports 5 point pitch and throttle curves, the new DX6 supports 7 point curves - wonderful! Some say the DX6i feels cheap because it doesn’t weigh much (due mostly to 4 less batteries). I like the lower weight and can hang onto the DX6i with no fatigue for many flights without using a neck strap. The low weight also means if butter fingers (nitro oil residue on the paws) strike and you end up dropping the DX6i, chances are it will survive the fall. This is the most amazing feature! A full function, 6 channel computerized radio & receiver, sporting spread spectrum modulation, DSMX protocol, model match, with all the important bells and whistles for $130 (radio only version). The newer DX6 with full on telemetry, backlit display, 250 model memory, and voice allerts is only $230! This is a great value radio no matter how you stack it. With all those features, it's even a much better value than the orignal 6i! Not much more to say on this topic other than it makes me ill when I think back to spending well over $400.00 back in 1982 (easily equal to $1000.00 in 2014 dollars) for my very first basic 4 channel AM RC airplane radio that was so primitive compared to the DX6 & DX6i both in functions and performance. The Recall – more specifically the lack of information regarding the problem that lead up to the recall. I have no problem with a product being recalled, it shows the manufacture cares about their customers. Horizon Hobby dealt with the recall quickly and made the process of sending the DX6i in so easy with an online shipping form etc. The Spektrum DX6i recall is very old news of course (way back in 2008) and if you are getting a new DX6i or DX6, you have nothing to worry about; in fact only a small percentage were even effected by the recall. I unfortunately am a magnet for this kind of thing and ended up with one of the small number of DX6i’s that fell into the recall. The end grips on the Gimbals are very sharp. After several flights, I found my thumbs getting uncomfortably sore. The fix is easy... Unscrew the end grips and pass them over a smooth file a couple times just to take down the sharp high points. No more sore thumbs now.The DX6i has two bearing gimbals, the new DX6 has four bearing gimbals. I know 3-4 seconds is not that long for downloading a model from memory and really not a big issue, one you won’t even recognize unless you have had higher end computerized radios to compare it to – but again, I had to mention it if I am giving a true subjective review here. Not an issue with the DX6! This again is just a minor annoyance, but worth mentioning. All of Spektrum's & JR's radio’s recharging ports are configured with a negative center pin and the outside sleeve is positive. This is backwards from most other manufacturers. It is not an issue if you only use the charger that comes with the radio, but like most of us with computerized chargers, I want to use my computerized charger when charging my radio so I can monitor battery charge & condition. This is not a big deal as long as you remember to reverse the polarity of the banana plugs and most good computerized chargers will warn if the polarity is hooked up backwards. I only mention this as something to watch out for. This is an entry level radio, so don't expect the best toggles, menu scroll wheel, or digital trims. If you are looking for great value and performance in a computerized radio with features usually seen on computerized radios that cost more, the Spektrum DX6i is hard to beat. In the entry level computerized RC radio world, the DX6i offers great bang for the buck in my opinion, yet gets you into a good name brand system! The "radio only" version is the perfect choice if you already have several BNF Blade or Eflite aircraft that came with simple non computerized radios and you now want to upgrade to the DX6i at a very attractive price point. The newer DX6 for only $50 bucks more, offers even better value based on the DX9's architecture. Quad bearing gimbals, back-lit display, 7 point curves, voice alert, telemetry, SD card support, cordless trainer, & 250 model memory round out the highlights.